* Titanium Silver Finish These Corvette C6 systems can be installed in just minutes and are good for approximately 14-20 horsepower, depending on other modifications. They will enhance the performance of other power adders such as performance exhaust and performance throttle body and are available to fit 2005 through 2007 Corvette C6 models. 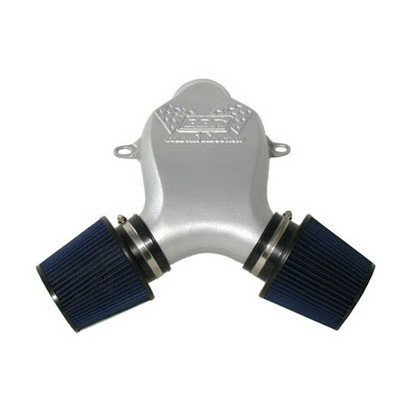 These BBK Corvette C6 Cold Air Intake Systems utilize high flow washable cotton element filters and are CAD designed for optimum airflow and Maximum Performance. All 05-07 Corvette kits are vehicle specific and are designed as a direct bolt on using simple hand tools - For maximum performance for your Corvette we recommend adding a throttle body and exhaust system. Click Here for Instructions No one else can Stack up to the bold clean styling of our aftermarket Billet / Stainless Steel Dress Ups, Street / Strip / Racing Suspension and Performance Parts for your American Muscle Car! Fits these Vehicles: 2005 2006 2007 Chevrolet Corvette LS2 C5 5.7L.